The kit is supplied with a universal crank pulley with 2 grooves. The narrow groove closest to the damper is used for the Saginaw installation. Install the new crankshaft damper retaining bolt, the washer is not reused. A longer damper bolt is supplied. The new pulley must register inside the crankshaft damper. Many dampers are damaged from being hammered onto the crankshaft snout. the damper bore and mating surface must be repaired. The damper bolt is 9/16”-18 tpi and correct torque is 125-135 ft lbs. Install the 2 allen head bolts in the pulley before tightening the damper bolt. The cast bracket installs like an original Ford bracket by means of a special bolt threaded into the pipe thread fitting in the side of the water pump. 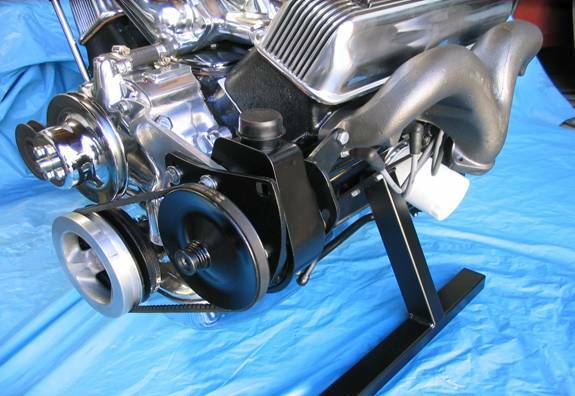 Use thread sealer on the special bolt to prevent water leaks. A longer 5/16” bolt is used to attach the end of the bracket to the water pump. Do not install the pulley on the power steering pump until the bracket has been mounted on the front of the pump. Use the bolt supplied with your pump to install the pulley; do not force it on the shaft. Set the backside of the pulley ¾” from the face of the steel bracket. An additional support bracket is supplied to support the pump. It attaches to the back of the pump and the front exhaust manifold bolt. ALTHOUGH MOST GM PUMPS MOUNT THE SAME THERE ARE NUMEROUS CANISTER AND RETURN LINE ORIENTATIONS.